If it seems like every time you turn around your child has learned a new skill, you're not mistaken. These years are a period of extremely rapid brain development, ushered by two simultaneous processes: synaptogenesis and myelination. Synaptogenesis links neurons together into sophisticated networks through the creation of new synapses in the brain. Meanwhile, myelination sheathes the nerves in a fatty, protective coating that enables faster transmission of brain signals. Here are some of the ways you may see brain development displayed in your child right now. Children's brains grow in a preprogrammed, bottom-up sequence that is, from the primitive sections of the brain to the more sophisticated sections. Experts agree that there are critical periods in brain development during which children are especially sensitive to the environment for learning. From there, cognitive advancements are a matter of stimulating the neurons and their connections, which strengthens them and broadens their functionality. 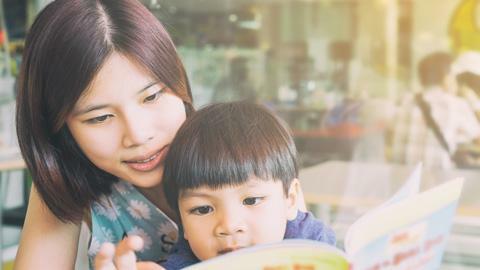 While most children aren't reading by the age of 5, between 37 months and 5 years old, they are learning to recognize letters and associate them with sounds. As your child grows more agile, his brain continues to hone the processes that are key to balance and coordination. During the preschool years, he's also developing executive functions, abilities that are essential for more complex physical activities. Repetition is key to advancement; neural connections are strengthened with the use of both large- and small-muscle movements. At this age, fine motor skills also become more important, as your child learns to write, draw, build, and create in ways that require his hands to do exactly what his brain tells them to. The "use it or lose it" rule of brain development is key in understanding your child's socialization. Studies have shown dramatic differences between children who experience frequent interactions with parents and other caregivers and children who are raised with less stimulation. Social interactions reinforce the synaptic connections involved with language and other forms of communication and social expression, while those not used become weak and disappear with disuse. You will see similar changes in other areas of social interaction, particularly as your child begins to establish relationships with his peers. Ever wonder why it's difficult to distinguish and understand sounds and syllables that aren't used in your native language? Your child's brain first forms the synaptic connections necessary to hear and produce all the sounds used by all languages around the world. But with use and disuse, these connections either become strengthened or are pruned away to favor those he hears and uses in his native language. Your child's communication skills take a quantum leap during these years. He becomes a much better listener and responds more readily when spoken to. Best, J. R. Effects of physical activity on children's executive function: contributions of experimental research on aerobic exercise. Developmental Review 30 (2010). 331-351.